I wrote the greater part of the hymn, "O Zion, haste," in the year 1868. I had written many hymns before, and one night, while I was sitting up with one of my children who was ill of typhoid fever, I thought I should like to write a missionary hymn to the tune of the hymn beginning "Hark, hark, my soul, angelic songs are swelling," as I was fond of that tune; but as I could not then get a refrain I liked, I left the hymn unfinished, and about three years later I finished it by writing the refrain which now forms part of it. By some mistake 1891 is given instead of 1871 as the date of the hymn in the (Episcopal) Hymnal. I do not think it is ever sung to the tune for which I wrote it. Rev. John Anketell told me, and I am sure he is right, that it is better for a hymn to have a tune of its own, and I feel much indebted to the composer of the tune "Tidings" for writing so inspiring a tune to my words. James Walch was a musician and composer, born near Bolton in 1837. He spent his early life in the town and was organist in several churches there, including the parish church of St George’s. From 1870-1877, he was conductor for the Bolton Philharmonic Society. He also composed at least four published hymn tunes, the best known of which is called “Tidings”. 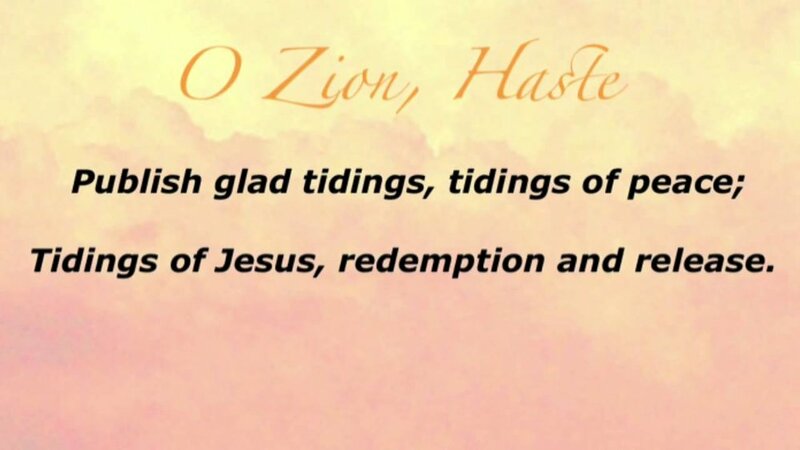 Written in 1875, it’s usually used as the tune to a hymn called “O Zion Haste”. James Walch was a musical instrument dealer by trade, and moved to Barrow-in-Furness in 1877. He later moved to Llandudno Junction in North Wales, where he died in August 1901 and was buried locally. His wife later donated money to pay for the organs in two local churches, St Paul's Llandudno and All Saints Deganwy, in his memory.